to add a coastal or nautical feel to your home. Here are three variations on ways to make beach bottles. The first one I am going to show is the most basic. a small beach-related object to put on top. The Perfect Mason Jar Paint Technique? the Dollar Tree in the toy section. They were painted shades of white. wine bottle corks to fit. You could also use rolled up paper. bottle if it is going to stay a beach bottle forever. bottle before moving the twine up on to the cork. I think it will come off the bottle easily. more hot glue on it to attach the twine. upright until the glue dries and it can stand on its own. clear blue glass look to the faux fishing floats I made last year. Summer of '12 Mantle are being used in the dining room. collection of faux coral that I made a couple of summers ago. items in the floral section of craft stores, click "DIY Coral". in the back of the chest as well as the folding mirrored screen. a pile of DIY Whimsical Starfish. Beside the urn, is a vignette on the dining room buffet. were made out of garden urns. by having a pretty shell hot glued onto the knob on top. The amber glass fishing floats also came from Hobby Lobby. The fan shaped "coral" and the middle coral collage are homemade. the faux Pottery Barn corals. have the glare of glass over a print. has a collection of bottled sand from every beach she has been to. the bottle without making a big mess. You will need skinny shells to get in a bottle like this. you don't end up with a beach on your floor. kid friendly, you could use a plastic jar instead of glass. beach view of different shells that emerge from the sand. bottle or jar so the contents won't come out accidentally. putting twine on the top, or gluing objects on at the end. burned fingers) than I thought it would. letting the rays swim between my feet to not use them. so this beach bottle went on the end table in the family room. I think it will be a fun conversation piece. with every twist...kind of like a sandy kaleidoscope. I love the blue beach bottles! 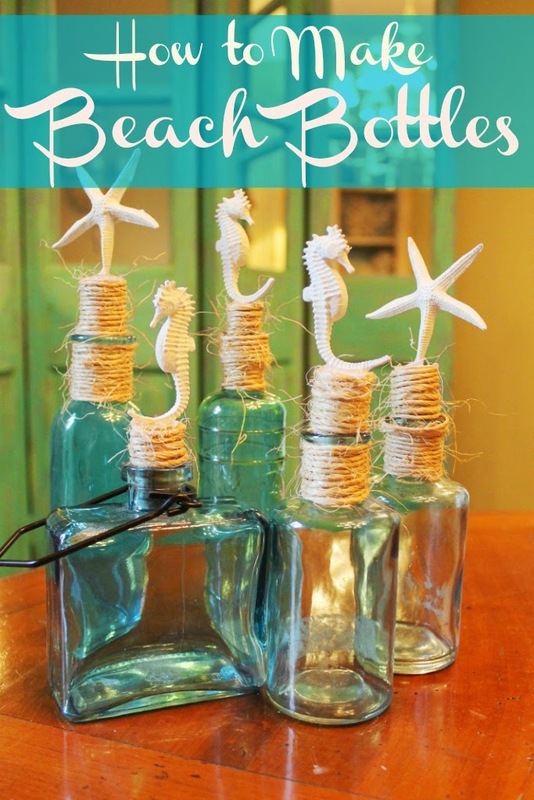 My guest bedroom has kind of evolved over time into a beach theme, so I need to make one or two of these. Love the table display, also. This is a great post with such a wonderful variety of sand bottles! I also am totally in love with your faux coral!! HELLO!!! Why didn't I see that before?? You have a great beach/shell collection there. Love all your ideas!! You have got to be the QUEEN bee of beach decor. I'm so inspired now I could almost stay up all night to make some. You have so much absolutely gorgeous beach stuff, I'm envious. I'd be hard put to say which is my favorite, what about you? I have several blue bottles I've collected so they just might be turned into beach decor. Hubs got some 4x4's or 2x4's, whichever to make some bouy's for me. We used to live in San Diego and I was a beach nut, we lived inland but we were at beach every chance I got. I miss all that beachy stuff. Usually have shells around, things like that but don't get too carried away. So glad you shared all your wonderful beachy goodies. Bye now. Just gorgeous! Today must be coastal day. I just finished a coastal rit dye vase. I am so excited about how it turned out. These bottles are so so cute! Love your nautical bottles and that faux coral is amazing. It looks beautiful in your cabinet. in the cabinet are amazing, too.